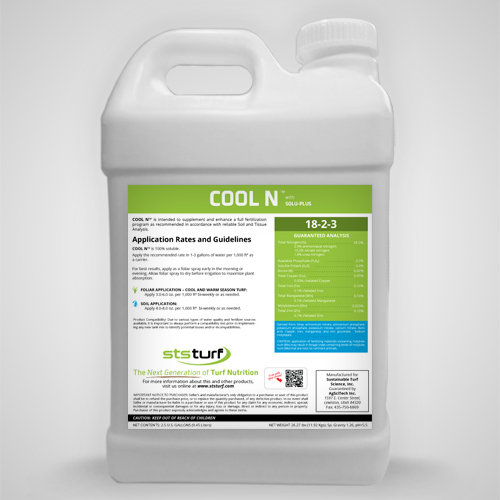 Cool N 18-2-3 is designed for foliar application during cooler weather conditions, as well as, year round soil applications, to promote optimum health and color. Cool N 18-2-3 delivers highly available N-P-K, in addition to a complete micronutrient package. Our Nutrient Mining Technology™, Solu-Plus, is included to maximize nutrient absorption and/or uptake. Cool N 18-2-3 is predominantly a nitrate (NO3) based nitrogen source, which is ideal for promoting healthy growth and color during cooler periods, or in areas where fusarium pressure is an issue. Based on studies using various nitrogen sources, cool season grasses treated with the urea form of nitrogen, during wet, and cooler conditions, were more susceptible to a higher incidence of disease. Molybdenum is included to ensure nitrate reductase production, and help with phosphorus utilization.